Architects Appleton and Wolfard designed eight modern libraries in the 1950s and '60s for the San Francisco Public Library. Architects Appleton and Wolfard designed eight modern libraries in the 1950s and 1960s for the San Francisco Public Library, the largest number completed by a single firm. 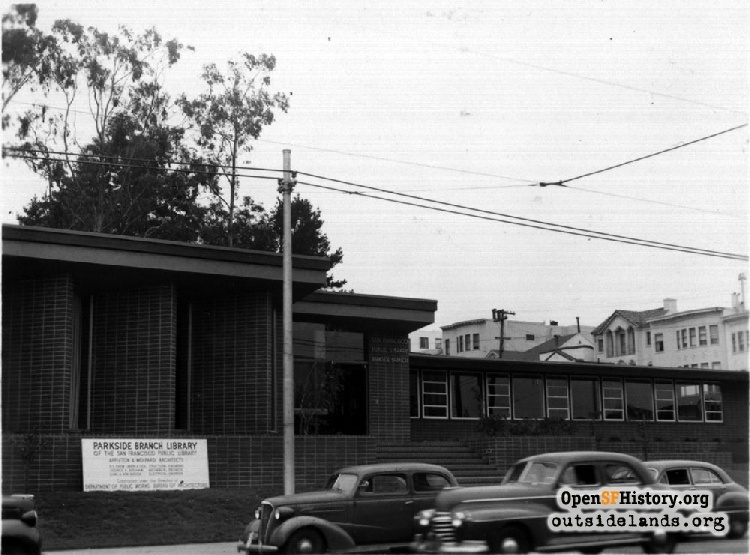 The first, the Parkside branch at Taraval Street and 22nd Avenue, set the pattern for the rest. In the early 2000s, these buildings faced rehabilitation to bring them into compliance with current codes and ADA rules under a bond passed by voters in 2000. The upgrades did not alter their modern character significantly. That is fortunate since the libraries are good illustrations of postwar architecture. Built in 1951, on a one-story open plan with lots of glass and brick, the Parkside was hailed as the "finest branch library in the country. . .light, spacious and comfortably quiet." (San Francisco Chronicle, October 29, 1951) The Architect and Engineer (March 1952) noted that it had "the appearance of a swank country club or a modern luxurious residence," and that "its gay turquoise, yellow and natural brick color scheme" gave it the look of "a refined night club." Built on the edge of McCoppin Park, the building runs east and west along Taraval Street. Large windows on the north side provide ample light, while south-facing windows are angled at 45-degrees to the southeast to prevent the intrusion of harsh direct sunlight. The open plan featured a fireplace with reading lounge and an outside patio with landscaping by Lawrence Halprin. The library's cork floor and radiant heating were innovations for the time. The copper-hooded fireplace, along with furniture designed by Eamer and Hermann Miller, evoke the warm feeling of a suburban living room. And people did want to use the new building. 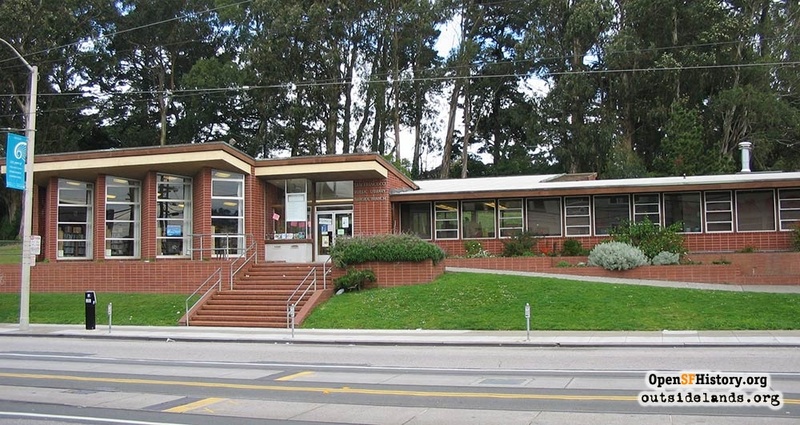 Attendance at the new Parkside Branch was double that of the previous facility that had opened in the mid-1930s in a rented one-story wood frame storefront at 1541 Taraval Street. 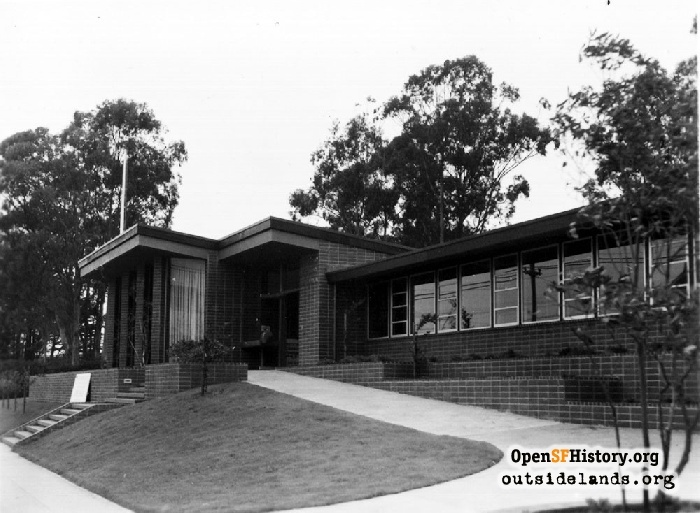 Its success led to further library commissions for Appleton and Wolfard: the Marina (1953), Ortega (1955), Merced (1957), North Beach (1958), Eureka (1960), Western Addition (1965) and Excelsior (1966) branches. Following the pattern of the Parkside, all the Appleton and Wolfard libraries look more like suburban homes than institutional buildings. Their signature details—exposed brick or masonry walls, wood beams, large areas of glass, patios, fireplaces (except the Western Addition and Excelsior) and reading lounges—give the air of informality and provide the comforts of a post-war California tract home. Wolfard liked doing residential design, and that interest may have informed his library plans. Educated at UC Berkeley, Harold Wolfard (1907-1977) received a master's degree in architecture in 1932, and was licensed in 1940. He joined Hyman and Appleton in the 1930s as a draftsman and later worked as an architect in the firm. The firm of Hyman and Appleton had a long tenure in San Francisco. Samuel Lightner Hyman (1885-1948) and Abraham Appleton (1887-1981) were both educated at UC Berkeley and L'ecole des Beaux Arts. Their work included the Jewish Community Center, with Arthur Brown, Jr. (demolished), Sinai Mortuary, Hebrew Home for the Aged, the Visitation Valley School, and many homes. In the 1930s, Hyman and Appleton also remodeled buildings, including the Crown Zellerbach building at 343 Sansome Street, in the art deco or art moderne idiom. Neither architect could be considered a "modernist," although Hyman's obituary (1948) says "of recent years he became absorbed in modern architecture." Wolfard brought the modern esthetic to the firm, which, shortly after Hyman's death, became Appleton and Wolfard. Robert Appleton, AIA, Abraham's son, joined the firm in 1950 after graduating from UC Berkeley in 1942 and receiving his architectural license in 1950. He worked on the branch libraries and remembers Wolfard as the lead designer. Appleton and Wolfard also designed the Hall of Flowers in Golden Gate Park and homes in St. Francis Wood, Sea Cliff, and other areas. Robert Appleton succeeded his father and worked with Wolfard until the firm closed in 1972. The Appleton and Wolfard branches are essentially unaltered since their original construction, although in some cases the floors, lights, ceilings, and windows may have been repaired or replaced. Each of the Appleton and Wolfard branches were rehabilitated from 2002-2008. Generally, the rehabilitation plans called for upgrading the fire, electrical and seismic systems. Major alternations involved making the bathrooms, doorways and passages ADA accessible. Some of the assumptions that informed library design in the early 1950s have changed. Space limitations limit the use of lounge seating although some comfortable chairs were incorporated in all the branches. The fireplaces are a non-conforming use for an assembly occupancy under present codes. A concern over theft prevents unfettered use of outdoor patios. Instead, libraries have become informal day care centers and community meeting places, both demanding more space. At the Parkside, the need for more space changed the original look and feeling. Bookcases rose above the rear windowsill, breaking the clean lines of the original design. Bookshelves and computer tables cluttered what was once an open, spacious interior. Children's drawings cover the fireplace. The patio was seldom used; being on the north side it was often too cold to use for reading and there is no outdoor furniture. The Halprin landscape became overgrown and intruded on the patio. On November 6, 2010, the updated and LEED Silver certified Parkside Branch reopened to the public. 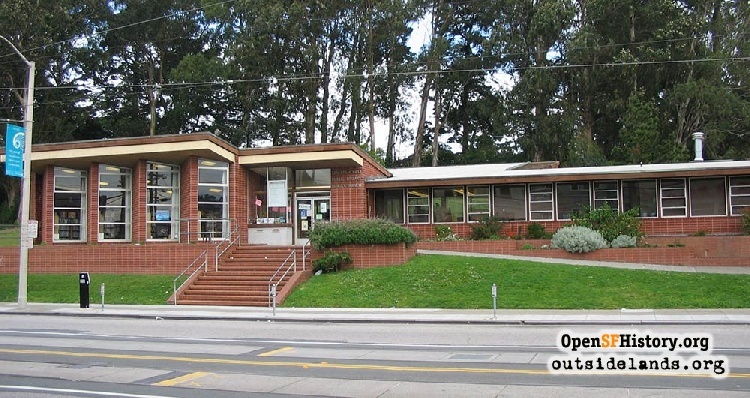 See a Virtual Tour of changes on the SFPL site. Contribute your own stories about the Parkside!